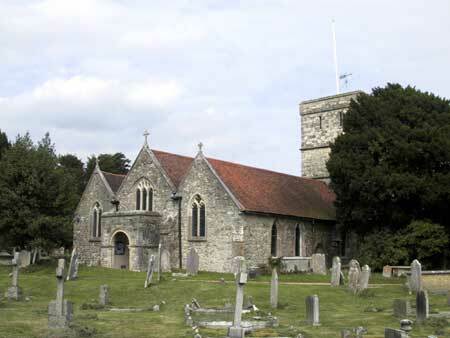 This 12th century Norman church with its large 7 acre churchyard looking out to Southampton Water stands incongruously close to the gates of Fawley oil refinery. Two chapels were added to the church in the 14th century and these extend the whole length of the church today. On 23 November 1940 a German bomb largely destroyed the chancel and the church was eventually restored and rededicated in 1959. Entrance is by the west doorway with its fine 'dog tooth' archway. Inside, the rounded Early English pillars lead up to the chancel arch with its two large stone corbels. 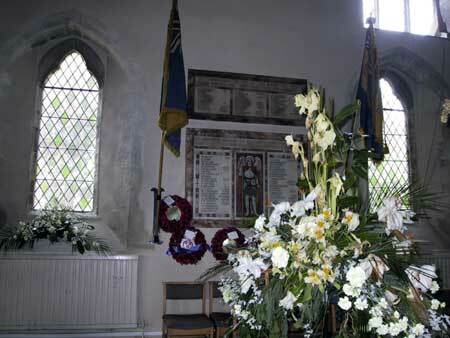 In the north aisle is an impressive coloured marble village war memorial depicting St George. Alongside is an interesting Peninsular war memorial commemorating Major Joseph Bradby of the 28 Regiment of Foot who died in Vittoria in August 1813 as a result of wounds received in the Battle of the Pyrenees. The north east window showing the three saints Alban, George and Martin was placed there as a thank offering for the bravery of the First World War soldiers. The main east window shows Christ in Majesty surrounded by Saints with the Dove of Peace overhead. On the north wall of the chancel is a 17th century brass, relating to Henry Audlay of Holbury Manor who died in 1606 having been Receiver General to the Countess of Southampton. An early Norman window in the central tower contains glass depicting the coats of arms of the Drummond family. In the arcade below are a series of memorial brasses covering many generations of the family beginning with Robert Drummond slain at the Battle of Colloden in 1746. Many of the others were bankers in Charing Cross. In the restored south chapel is a model of a long boat to commemorate the exile in the parish of islanders from Tristan de Cunha forced to leave the island following a volcanic eruption in 1961. Also in the south aisle is a statue of Christ the King, a gift from the Beaulieu parish and also a brass plate commemorating Mary Trattle who died in 1868 leaving £500 to be spent on Christmas gifts for the deserving poor. Other features in the church include a Jacobean pulpit and the ships bell of the tanker Esso Fawley. Outside two Mass clocks can be seen on the walls of the south chapel. On the north side is an unusual carved stone tomb chest dated 1686 in memory of James Osey. In the churchyard is a large granite cross which marks the grave of Flt Lt Kinkead D.S.O. DSC DFC who was killed in 1931 whilst attempting to break the world air speed record at Calshot. He was a member of the R.A.F. flight competing in the Schneider Trophy race.